It is a bad sign when I am too busy to look at my archive photos of skiing and snow. But that was indeed the case today. Things will calm down very soon and I will be posting fresh photos! 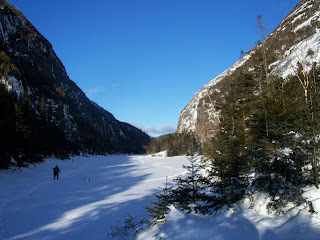 Today's photo shows one of our favorite Adirondack backcountry skiing destinations, Avalanche Lake, in the High Peaks. Photograph courtesy of Ed Reed.